Mature Height 1 - 2 ft. Mature Width 1 - 2 ft. 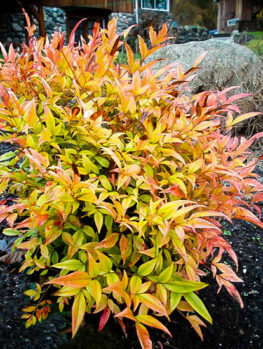 Firepower Nandina/Sacred Bamboo is a dwarf foliage plant that grows no more than 2 feet tall, yet it has the color-punch of a full size plant. 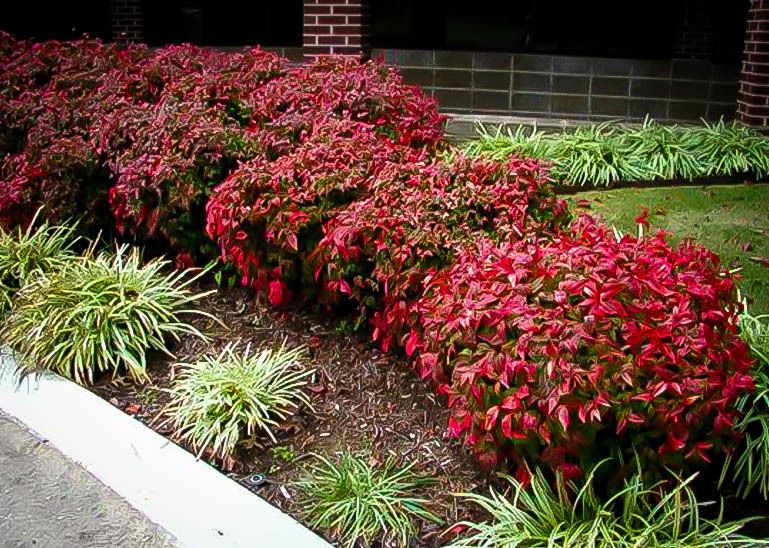 It is evergreen in warmer climates and in fall it turns into a burning mound of brilliant red, living up to its name and bringing fall color to the warmers areas. 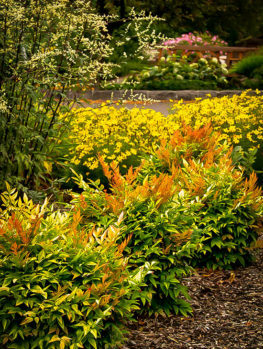 With its small size it is ideal for smaller gardens, as well as being the perfect edging or foreground plant for larger ones. 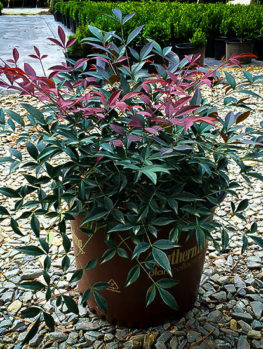 It can be grown in pots and planters too, and with its evergreen leaves it is a great way to keep your terrace or patio interesting all year round. It will grow in all light conditions, from full sun to deep shade. Plant your Firepower Sacred Bamboo in soil with lots of organic material added, and water well until it is established. After that it will be drought resistant and need no special care at all, as well as being pest and disease free. 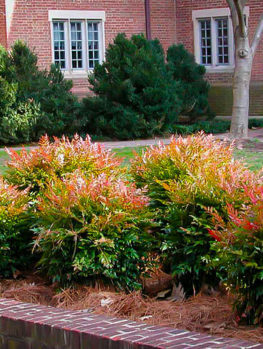 For the perfect foliage plant for warmer areas, you cannot pass by the Firepower Sacred Bamboo. Although many gardeners grow plants mainly for their flowers, the knowledgable gardener knows that flowers are usually only around for a few weeks, but foliage is forever, especially with evergreen plants. 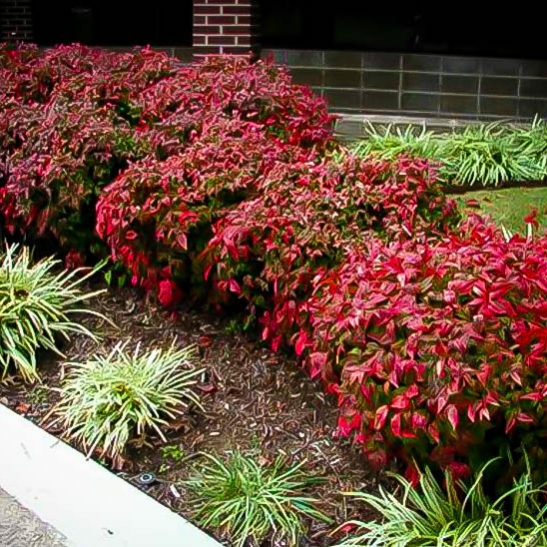 Foliage gives permanence and stability to the form of your garden and plantings, and makes the flowering plants you do have look even better. Foliage comes in lots of forms – from big, dramatic leaves to the tiny leaves of boxwood shrubs, or the slender leaves of grasses. 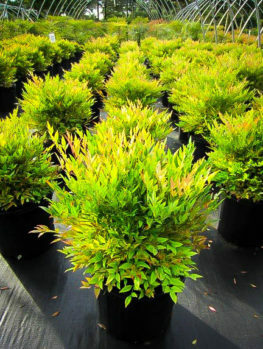 Foliage that creates an attractive ‘cloud’ of leaves is especially valuable in the garden, and it is here that the Firepower Sacred Bamboo really comes into its own. In small gardens particularly, almost all bamboo plants are too large and even worse, too invasive to be let through the garden gate, so a beautiful alternative like Sacred Bamboo is a real asset. This is especially true if you have an Asian-themed garden or courtyard, where that ‘bamboo’ look is essential, but Sacred Bamboo will fit into any style of garden with ease – it is such a versatile and attractive plant. The other great thing about Firepower Sacred Bamboo is that it will grow in a wide range of light conditions, from full sun to deep shade. The ideal is morning sun and afternoon shade, but this is a tough, tolerant plant that will grow happily with no direct light at all, or sit out in the full sun all day long. Firepower Sacred Bamboo forms a mound of leaves on a plant up to about two feet tall and as much across; and those leaves are gracefully carried in sprays that come from the cane-like stems. It is those canes, and the divided leaves, that give this plant its name of Sacred Bamboo, because they look rather like an especially elegant and attractive bamboo plant. It does not produce flowers or fruit, but it makes up for that by producing the most spectacular fall colors of fiery red in fall, which persist, with some darkening, throughout the winter. A prelude for that symphony of color will be seen from mid-summer on, when a few leaves begin to glow red among the green, but the fireworks really start in earnest when the cooler weather arrives. Choose a spot with some morning sun, if you can, to plant your Firepower Sacred Bamboo, as the fall colors will be best with some sun, but it will also thrive in light shade and grow well in deeper shade too. It will establish best in soil with plenty of organic material added, and while young it should be watered regularly. However once established it has great drought tolerance and will grow with very little care. It is also not subject to insect attack or diseases, so this really is the perfect plant for a beautiful low-maintenance garden. 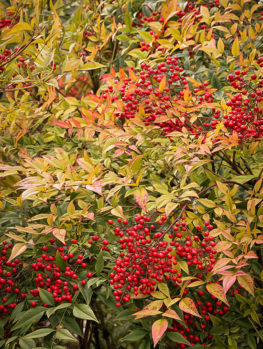 The Firepower Nandina is hardy from zones 6 to 9. In zones 8 to 10 Firepower Sacred Bamboo is evergreen and keeps its red fall leaves all winter, until they are added to by new, green growth in spring. 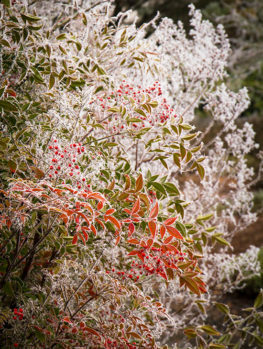 In cooler areas, when the temperature falls below 10oF it may lose some or all of its foliage, but the upright canes remain attractive. So this will happen if you live in the cooler parts of zone 7, and if you live in zone 6 you may see some canes die over winter, but the plant will sprout back from the base. So there are only a few gardeners – in the coldest regions – that cannot enjoy the beauty of Firepower Sacred Bamboo in their garden. The original Sacred Bamboo plant comes from Japan, China and India, where in the wild it can grow up to eight feet tall and four feet across. It has upright canes that sprout from the base, forming a dense clump, with each leaf divided into many small leaflets, giving a spray-like effect. The wild plant has tiny white flowers which produce clusters of red berries, but in many parts of the USA these can into the wild, competing with native plants, so it is fortunate in many ways that the Firepower Sacred Bamboo does not produce seeds. A number of variations of Sacred Bamboo exist, and Firepower Sacred Bamboo was found in a nursery in New Zealand as a natural variation of an older dwarf form. It was first brought into the USA in 1985, and it has become very popular in Florida and the South exactly because it does not flower and therefore cannot become invasive. Our plants are grown by rooting pieces carefully selected from plants descended from those original bushes. Avoid cheaper seedlings plants, which may grow large and invade wild areas nearby. The low height of Firepower Sacred Bamboo means it is a great foreground plant and edger for larger gardens, or a feature plant in a small one. 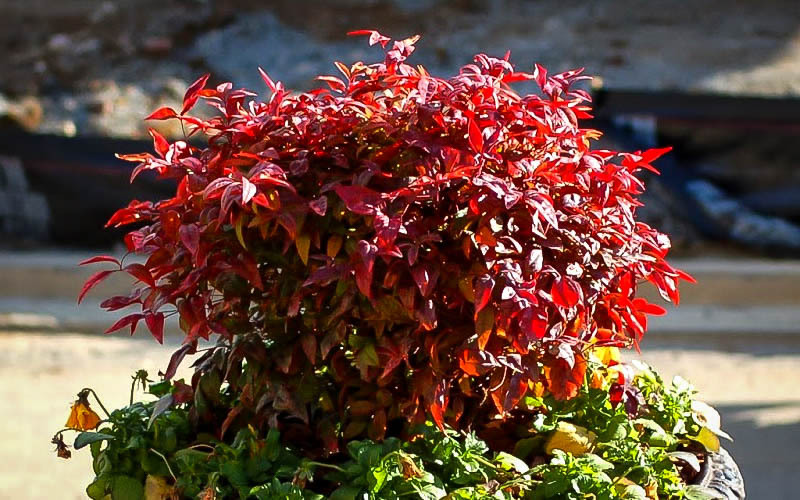 It can also be grown in containers or a large pot, so you don’t even need a garden to enjoy the airy beauty of this plant, or be amazed by its spectacular fall colors. 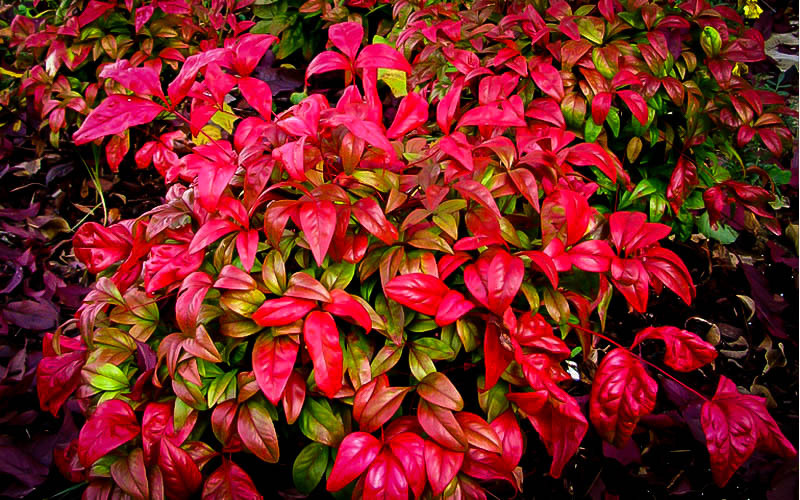 We have a good supply of plants, but this popular plant never stays around long, so order now and enjoy this trouble-free plant in your own garden. 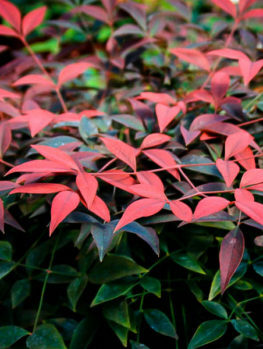 You may also want to consider other varieties like the Flirt Nandina or the Gulf Stream Nandina.